CONTRAST ... Cleadon Village, left, and the Woodbine Estate. 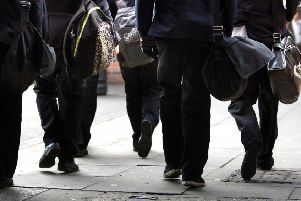 SHOCKING gaps in life expectancy rates between South Tyneside’s richest and poorest areas are revealed in a new report. Men living in Cleadon and East Boldon are expected to live, on average, until they are almost 81. That’s in stark contrast to those in the Monkton, Primrose and Beacon and Bents council ward areas, where life expectancy is only in the low 70s. And the gap is even wider when it comes to women, according to the figures. The shocking stats were outlined by town hll chiefs as South Tyneside Council puts forward its new Better Health and Wellbeing Strategy, as it prepares to take on public health responsibilitites for the borough next year. Its key target areas include tackling youth unemployment and reducing social isolation among older people. There are also plans to reduce levels of cancer and heart disease – the main illnesses contributing to the life expectancy gap – by help supporting people to quit smoking, cut down on alcohol consumption and manage their weight. Coun Allan West, lead member for Health and Wellbeing, said: “Responsibility for public health and wellbeing is being placed squarely on the shoulders of local councils like ours as of next April. “For some months now we have been in a transition phase – a journey towards that end. South Tyneside Council was one of the first in the country to create a dedicated cabinet portfolio for Health and Wellbeing, and it was filled by Councillor West in May. He added: “Our Health and Wellbeing Strategy sets out our five strategic priorities for the improvement of the health and wellbeing of our residents. “These priorities are based on solid evidence drawn from a thorough assessment of the health needs of our population. “For example, we know that life expectancy in South Tyneside is significantly behind the average for England. “There is a startling 12-year difference in life expectancy between women living in the Primrose ward, compared with Cleadon and East Boldon ward. “We also know that the proportion of expectant mothers smoking throughout pregnancy in South Tyneside is around twice the national average, as is the proportion of young people who are unemployed. Some of the actions are already under way, with the council urging the Government to support the plain packaging of tobacco products. There will also be a focus on the early identification of dementia, cancer and heart disease, while work is being done to reduce the numbers of women smoking in pregnancy.